Three opposition parties in the House of Commons, representing the majority of Canadian voters with a majority of House of Commons members, have decided to cooperate. That?s good. Very good. Conservatives will continue to have insecure support for their many policies contrary to progressive policies of the three minority parties, always angling for separatist and socialist support as they have done before. Stephane Dion?s Liberal Party coalition with the NDP, and with a firm commitment from Bloc MPs not to support non-confidence motions, will provide a period of stable, confident government for economic measures to meet the recession crisis in the economy, and to reassure Canadians. 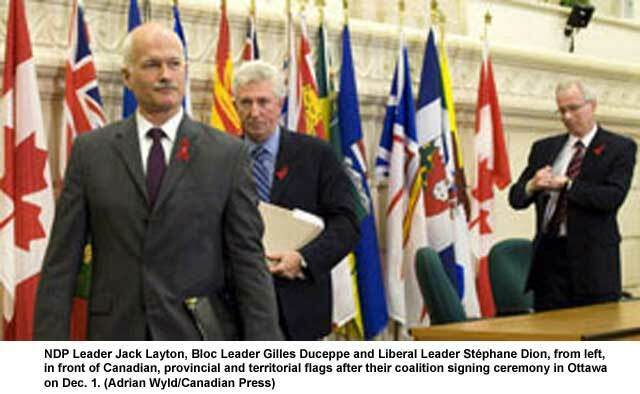 The coalition parties have similar social policies, which correspond with Quebec social programs approved by the Bloc. Stephane Dion and Jack Layton understand this. They know that progressive policies will strengthen unity sentiment in Quebec, but the new Conservative Party, like Republicans in the US, wants Canada to retreat from progressive social policy. They also fail to give strong environmental policy leadership. This drives Quebec away from federalism. Cooperation will restore progressive leadership and promote unity. We hear much complaining about partisan fighting in parliament. The coalition is a realistic plan for cooperation among political parties to restore progressive leadership. I applaud the humility of the three minority party leaders in their plan for cooperation, and applaud their determination to serve all Canadians. I support them.